Create new waterfront public open space by converting street ends into vest pocket parks that combine access, boat launches, and water transport hubs. Encourage boating on the river by adding capacity for boat launching and storage. Prioritize locations in close proximity to underserved areas. Design and build a waterfront park at 144th Street. Reclaim for public use the waterfront park property currently used by the Yankees for parking. 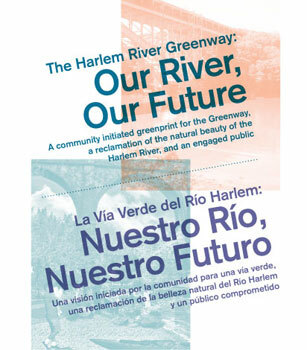 Provide access to the river from various points along the Harlem River Yards. Change how people utilize and think about the river by transforming it into a “water trail,” where water buses or ferries transport patrons to Yankee Stadium on game days and Bronx residents from place to place along the river. Mark the juncture of the South Bronx Greenway and Harlem River Greenway at Randall’s Island connector with well-lit pedestrian and bike paths , with nodes that include fitness zones, interactive art, murals, and green walls. Add access by extending the 161st Street pedestrian bridge to the waterfront. Acquire the four-acre waterfront site, south of University Bridge for an extension of Roberto Clemente State Park. If that is not possible, secure access along the river’s edge. Construct a pedestrian and bike bridge across the CSX tracks connecting to Putnam Line Greenway and Van Cortlandt Park. Add bikeshare stations at key transit stops in upland areas both as a mode of transportation to the waterfront and as a way to enjoy the Greenway. Add signage and wayfinding to key streets leading to the river. Make sure that all future transportation projects, such as planned improvements to University Bridge, increase people’s ability to bring boats and bicycles to the water. Engage public interest in use of the river and the Greenway through creative programming. Add vending and retail options along the river in the form of carts, concession stands, and locally-owned and operated restaurants. Create opportunities along the river to educate and celebrate the culture of the Bronx through the creation of a “moving museum” that runs on rail, or a “science barge” that moves up and down the river. Encourage the City of New York and Bronx cultural institutions to sponsor arts and botanical events, and temporary sculpture installations.